what happened 81 years ago in Vancouver. Most braving the steady rain were union members, mainly men and mainly older. Flags were unfurled, speeches offered, hands shaken and smiles exchanged. 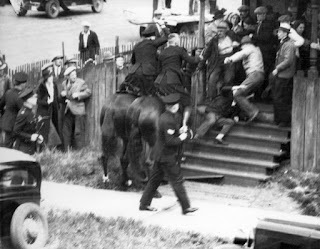 Just after noon on June 18, 1935, about 2000 striking longshoremen and various supporters, mainly men, left the union hall on East Hastings to peacefully march to Ballantyne Pier with the intention of talking down the replacement workers that were working on the ships in the dock. In the past the Union had been somewhat successful in convincing the scabs of the error of their ways. The strikers had been locked out since June 4th, and the employers had taken on scabs that they had been busy recruiting for several months. The employers' group, otherwise known as the Shipping Federation, had prepared for this day and had organised politicians to support a plan to deal with the waterfront situation. That plan included the hiring of scabs, police specials, and the coordination of three levels of police. The photos of the day tell a powerful story. Men, dressed in their Sunday-best, including many veterans from the First World War with medals pinned to their chests, walked, peacefully by all accounts, towards the Pier. 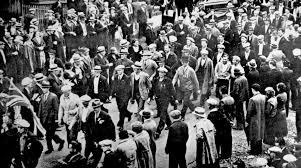 When the longshoremen and their supporters arrived at Ballantyne Pier they were greeted by hundreds of city police, with Provincial police hiding behind boxcars with Thompson machine guns. RCMP officers carrying long batons, and mounted on horses, rounded out the heavies. Tear gas was fired and the mounted police rode into the crowd of marchers, swinging long clubs. The police pursued the fleeing marchers through the surrounding streets, even riding up the steps of houses where women and children were gathered. 1:20 p.m. Tear gas bombs were fired by Royal Canadian Mounted Police over the heads of the crowd, mounted city and Provincial police charged them at full gallop and foot police swung into action with batons this afternoon when thousands of longshore strikers and sympathizers tried to break through the guard and march onto Ballantyne Pier. At day's end, over 100 marchers were treated in hospitals. Many others were injured but afraid to go to hospitals or doctors. At least two were shot. No one was killed. In the end, the strike was broken. The employers' group broke the union in 1935 as they had done four other times since 1909. Ultimately, in the 1940s, union members prevailed and the ILWU was formed. A monument was erected at New Brighton Park in 2010 to remember the Battle of Ballantyne Pier. It's a tribute to the workers who faced down guns, batons and tear gas to achieve something of lasting value for all Canadians. As speaker after speaker mentioned in the day's service, including Simpson Shane MLA, Vancouver-Hastings, the rich and powerful are constantly looking for ways to take more and more from working people in Canada, be it through their "free trade" agreements, the dismantling of public school system, or the privatisation of health care. To remember the Battle of Ballantyne Pier is not just about remembering; it's about standing on guard and being willing to take a stand, no matter the consequence. Photos, except where noted, by Jeem. Open and airy, the café is a throwback of sorts to the kind of place one might expect to find in Italy, and that certainly serves as the inspiration. The coffees are well crafted, strong, bold and flavourful. House-made sandwiches are delectable. A variety of confections line the wall, and while there are cozier seating arrangements, the large wooden table is a focal point for conversation with your neighbours. Something new for these hot days is espresso and tonic water. This one is made with Fever Tree tonic, lots of ice and two shots of espresso. The espresso rests at the top of the glass until a straw is added. Within seconds the glass erupts in a bubbly mixture. The taste is entirely refreshing. This could be the best iced coffee drink of the summer, and it's another reason to visit this great café in Marpole. 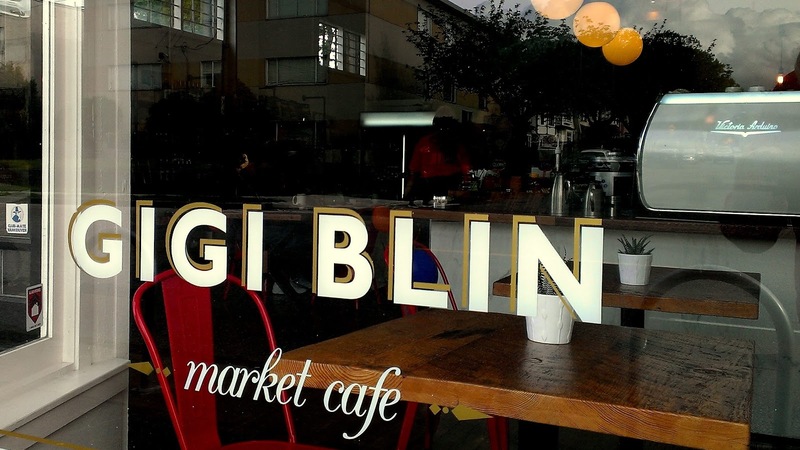 Friendly service, good people and great coffees; Gigi Blin Market Café is open everyday. It's well worth many repeat visits. It happens every May and it only seems to last a month... spot prawns from our own local waters! What we call spot prawns are the largest of seven commercially harvest shrimp found in Canada's left coast waters. Large females (and they are pretty much all females by the time we get them) can measure 23 cm in total length, though the edible tail is much smaller. We get our prawns live, from Oakridge Fish Market, which is our favourite shop for fresh seafood. The owners, Annie and Jimmy, offer great service and reasonable prices, and they've had their store since the mid-1990s. The prawns are put into a plastic bag, which is then wrapped in paper. Of course the prawns try to escape and the bag is often punctured and the paper wet. The whole thing smells of the ocean, and that's a good sign. In theory the prawns should last a day or two in the fridge, but we always cook them up the same day. Getting the prawns into a pot or pan can be challenging as the creatures flop about irrationally. This can be annoying. Their ultimate fate is to be thrown onto an already heated barbecue, which can be a wee bit upsetting, especially for the prawns. It's either that, or drowning them in tap water first; we've opted for the straight-to-the-coals approach. And no, those weird sounds coming from the barbecue are not the prawns screaming in horror. At least that's what I tell myself. After two minutes on the barbie, give-or-take, the prawns are ready to be served, and here to the barbarism continues as the prawn's large head (it's most of the creature's total body size) is torn off with bare hands. I suppose one could use a sharp implement, but after death by fire it seems only fitting to continue the savage nature of this feast. The barbecued tail, shell removed, is tender, delicate and sweet. Dipped in a bit of melted butter can be nice, but the prawns are fine just by themselves. Scrumptious in fact. A salad, a wee drop of wine, and slightly less than a kilo of spot prawns between two makes for a wonderful dining experience. The resulting mess of heads and shells is all that's left. Most of our prawns come from the inside waters of Vancouver Island. They are harvested with traps and not by the more destructive practice of bottom trawls used for most other shrimp harvests. About ninety percent of our commercial harvested spot prawns are frozen and exported to Japan. The balance is sold fresh and live to people in BC. Prices can fluctuate dramatically and that's been the case this year already, with prices going up almost forty percent in two weeks. Of interest, spot prawns are protandric hermaphroditic meaning that each individual initially matures as a male and then passes through a transition stage to become a female. In BC waters, spot prawns usually live about four years. Apparently they spend the first three years as males, and then transform into females for their final year of life. You can't make this stuff up.